College is a pretty pricey proposition, even after grants and scholarships are factored in. And the millions of students graduating this spring will soon learn just how expensive their degrees were when they start getting student-loan bills. 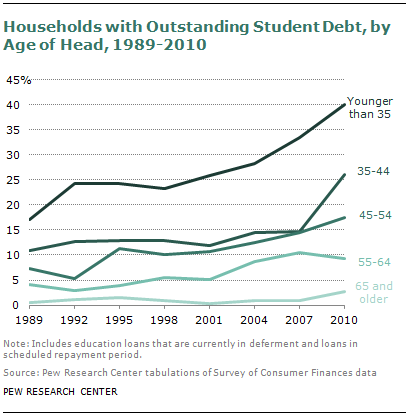 As a Pew Research Center analysis noted last year, nearly one in five U.S. households (19%) owed money on student loans in 2010, more than double the proportion in 1989. Among households headed by someone younger than 35 (i.e., people more likely to be recent college graduates), a record 40% had student-loan debt outstanding. Somewhat older data from the National Postsecondary Student Aid Study (analyzed by both Pew Research and the College Board) breaks down debt levels by type of institution and degree. As of the 2007-08 academic year, for instance, 25% of students who earned bachelor’s degrees from private nonprofit colleges carried more than $30,000 in debt, compared with 12% of public-college graduates and a remarkable 57% of graduates of private, for-profit schools. According to the College Board, loans from all sources accounted for 40.4% of the $191.8 billion spent on financing undergraduate education in 2011-12. Grants from all sources accounted for 50.6%, with education tax benefits and work-study making up the rest. On average, public sources accounted for about 70% of total higher-ed expenditures in the 31 countries studied by the OECD, versus 38% in the United States.